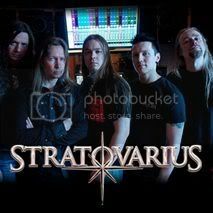 Last year Jörg Michael announced his departure from STRATOVARIUS after sixteen years of incredible drumming, countless tours and nine studio albums. Jörg played his final tour with the band in 2011. One of the last concerts in Finland was recorded, and will be released as a Live DVD/Blu-ray/2CD on June 29th. 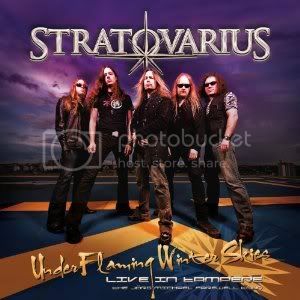 It is titled Under Flaming Winter Skies – Live In Tampere. The DVD is the first live DVD the band has ever released, and sadly it is the final for Jörg Michael. It includes two hours of a very powerful live show, plus a 30 minute long documentary about the band with interviews with all band members. It is a must-have for all Stratovarius fans with lots of inside information, very honest interviews, and the once in a lifetime departure of an outstanding member and friend: Jörg Michael. Even though he will still be working for the band on the management and agency side, it was a dramatic and nostalgic moment when he finally left the stage. It was not easy to find a new drummer who is not only an excellent musician and a cool guy, but also courageous enough trying to fill the big hole Jörg Michael has left. 24 year old Rolf Pilve from Finland is that courageous and gifted drummer. Says singer Timo Kotipelto: "Although the competition was fierce, Rolf was clearly the best one of the bunch. His precise playing, sureness and right attitude was there right away. He has an astonishing technique and to top that of he has a very musical way of playing, so he can bring something of his own into our old songs as well. Rolf has played a variety of different styles of metal, so fast tempos or more progressive parts will not be a problem. Whatever songs we might compose in the future – I have no doubt that he will be able to play them." Adds Rolf Pilve: "I had prepared for the audition thoroughly, learning all the songs we agreed on, with the live-endings and everything. In addition to that I had also learned some extra songs just to be safe. Playing with the guys was excellent, and already the next day after the audition I got to hear that I had been the best one of the drummers they had auditioned. What followed was yet another audition where we would play more casually and jam." The band received more than 100 applications, some of them very competent and high caliber Finns, but also included were some foreign drummers who had already made a name for themselves. Under Flaming Winter Skies - Live In Tampere features hits and classics like 'Under Flaming Skies', 'Speed Of Light' and 'Hunting High And Low' as well as exclusive bonus material (30 min documentary about the band's history, exclusive interviews with each member as well as a special comment from Jörg Michael about the reasons to leave the band) makes it a must-have for every fan and a real collector's item not to miss. Each of the formats (2CD / DVD / Blu-Ray) includes a different booklet - the same cover and interview with Jörg but different rare pictures.